This LED resistor calculator is a tool for determining what resistor you should use when creating different electronic circuits with LEDs. Thanks to these calculations, you can be sure that you won't damage the diodes with excessive current. 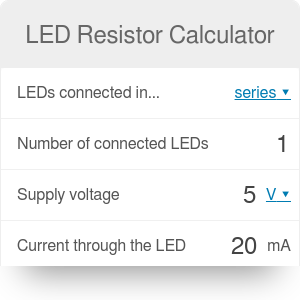 You can use this LED calculator to find both the required resistance and the power dissipation in a single LED, all LEDs, or in the resistor. LEDs, or light-emitting diodes, are small electronic components. When current is applied to LEDs, they emit light in various colors, such as red, green, or blue. If the current passing through the diode is too high, though, it will damage the LED. To limit the current passing through the diode, it's common practice to add a resistor to the circuit, as shown in this image. This resistor is usually added in series. Even though this method is uncomplicated and solves the problem in basic circuits, it shouldn't be applied for high-current LEDs. Circuit type. Are your LEDs connected in series or in parallel? n - number of connected LEDs. V - supply voltage of your circuit. Typical values are 5, 7 and 12 volts for molex connectors and 1.5 or 9 volts for batteries. Vₒ - voltage drop across one LED. This value depends on the LED color and ranges from 1.7 volts (infrared) to 3.6 (white or blue diodes). Iₒ - current across one LED. Regular LEDs require 20 or 30 mA. If you connect a few diodes in series, or are calculating the resistor for just one diode, you can use the formulas listed below. Wondering where these formulas come from? Take a look at the Ohm's law calculator! LED Resistor Calculator can be embedded on your website to enrich the content you wrote and make it easier for your visitors to understand your message.